I was just surprised to see that I have not posted Matar Paneer recipe in my blog yet. 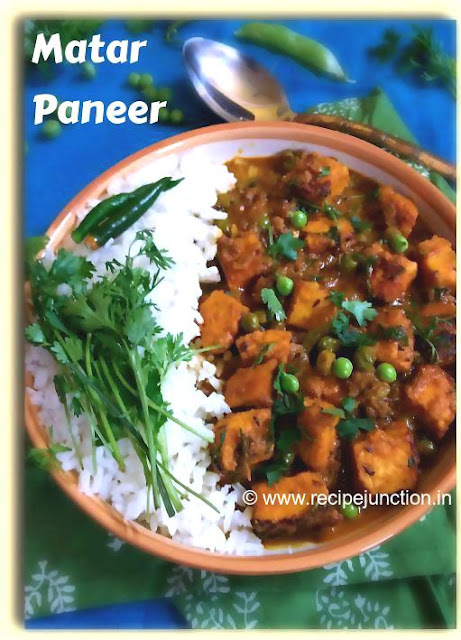 I have quite a few paneer recipes(more precisely 22 recipes) in my blog, but I never posted this recipe yet may be because I do not cook this recipe a lot. My daughter being a great paneer fan, I need to cook paneer at least once or twice a week, but she does not like Matar paneer much. 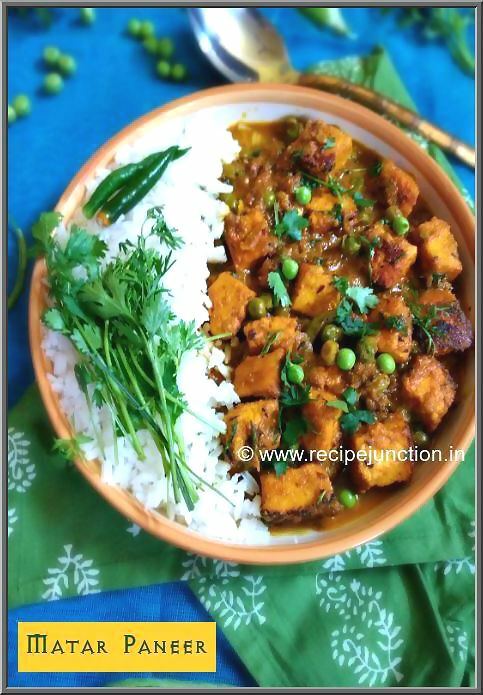 So, this weekend I experimented a bit and served her this matar paneer with my fingers crossed and she loved it a lot and gave me approval to post this recipe in my blog. So, I am posting this recipe for you all to try out this way. Though my daughter paired it with rotis, I devoured this paneer curry with rice and loved it, so you'll are seeing these pics served with rice. 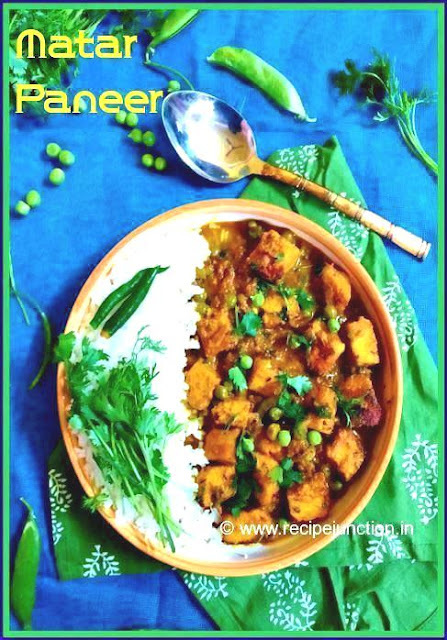 It's up to you with what you want to serve this paneer curry, goes well with both rice and roti/paratha. It is quite easy-to-make but gives a divine result. It even goes well with Veg. pulao/fried rice on the side. Ginger-garlic paste : 1 heaped tblsp. Heat 1 tblsp. oil in a pan and fry paneer pieces adding a little salt over it till they are light brown from all sides. Remove and keep aside. In the same pan, add 1 more tblsp. of oil, temper with bay leaf and cumin seeds. When seeds crackle, add sliced onions, saute till they turn translucent. Add ginger-garlic paste and sliced green chillies, saute for couple of minutes, then add tomato paste or puree. In there, add all powdered spices and carefully fry the masala till it leaves the side of the pan, add green peas and fried paneer pieces. Season with salt and sugar. Mix the masala well with paneer pieces. Now add 1 cup of warm water, add some chopped fresh coriander leaves and cover the lid. In medium flame, let it cook till you have desired consistency of gravy. Lastly garnish with some more coriander leaves and remove from heat. Serve it with whatever you like Rice/pulao/roti/chapati/paratha and enjoy hot.